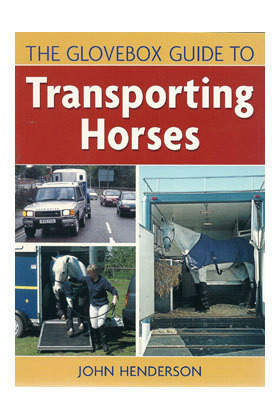 The Glovebox Guide to Transporting Horses by John Henderson. This is absolutely the most thorough book on hauling horses we have seen. Although the British terminology may occasionally be puzzling, it can be figured out, and most readers will have enough knowledge of Britishisms to understand "lorry," "horsebox," and "caravan." Regulations quoted are, of course, applicable only in the UK, but there is so much good advice here that everyone everywhere should read this thoroughly before taking a horse on the road. Chapters include selecting and buying a tow vehicle and trailer, "preparing for the worst," pre-drive checks, actual driving, loading and hauling horses, and maintenance of both vehicle and trailer. In the back are a number of handy checklists – things to look for during selection of vehicle and trailer, things to take, first-aid kits for horse and rider, and pre-drive, hitching up, and post-drive checks. Softcover, 210pp.